Wool, fur and feathers consist primarily of keratin which is one of the most indegestible proteins. There are, however, some insects which are adapted for feeding on this diet. Special conditions in their gut enable them to break down the sulphur linkages in the keratin and thus render it digestible. 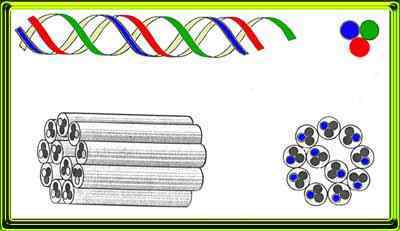 Suffice to say that the items listed above are complex chemical structures consisting of three alpha-helical polypeptide strands coiled into a rope and eleven of these units to make a micro-fibril (see diagram below). In the wild insects that can digest keratin probably feed on the remains of animals left by the carrion eaters, but they are also found in nests and lairs containing down or hair. However, keratin alone does not provide a sufficient diet for the normal development of an insect. It lacks, for instance, certain vitamins. In the wild an insect wil have plenty of opportunities for supplementing it's diet, but this is not possible if it is feeding on a completely clean textile. If if is to thrive it must be able to eat small ammounts of food remains or traces of sweat and urine. In addition to the true specialists there are many animals occurring indoors which occasionally gnaw textiles. This may be because there are stains on the material to which they are attracted, but they may also do so in order to pupate. Rats and mice often cause serious damage by gnawing textiles, particularly in store and warehouses, when they are gathering nesting materials. Clothes moths are small, yellowish or golden insects, with narrow wings fringed with long hairs. They are not attracted to light, and attempt to hide when disturbed, so the housewife is not likely to see them. However, they are occasionally seen flying in subdued light. Most moths suspected by the layman to be clothes moths are other species, usually harmless accidental intruders. Clothes moths are most likely to become evident from damaged fabrics and by the presence of silken webs spun by the larvae. The larvae can feed on clothing, carpets, rugs, furs, fabrics, blankets, stored wool products, upholstery, piano felts, and brush bristles. They may feed on fabrics of vegetable origin or synthetics, if the fabrics are mixed with wool, or may use such materials to construct their cocoons.